in Stirling since the 1690s with scrolls on the shoulders of the stone. There are 16 stones of broadly similar design dated from 1696 to 1737. The swags of evergreen leaves represent Heaven. 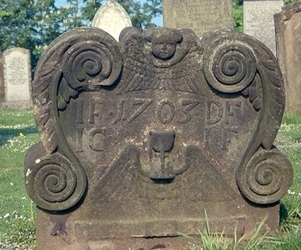 Other Emblems of Immortality include the ‘winged soul’, a winged face or figure flying heavenwards, found on many stones. 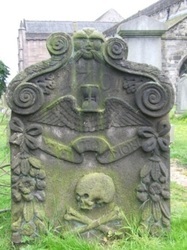 But reminders of death include the winged hourglass – symbolising the flight of time. 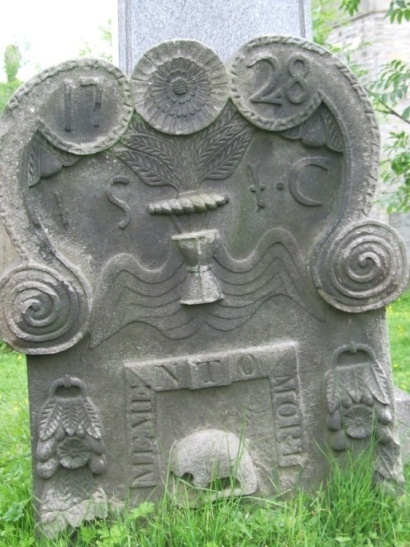 The Latin words Memento Mori mean Remember Death and the skulls and bones found on so many older stones are also reminders of death –and do not indicate that the person died of plague, or was a pirate! John Paton and his wife Janet Park set up their stone (at the right, above) in 1701; their names are on the reverse of the stone. But they lived for years after this. The stone does not commemorate them but is a status symbol and asserts their right to burial in this plot. Such‘marker stones’ are quite common in parts of Central Scotland, particularly the Stirling area.